Icon library for Total Commander in flat style. Flat icon pack for Total Commander. Last edited by efesreal on 2016-05-26, 08:31 UTC, edited 1 time in total. I would prefer the colour of the icon 112 and 113 for the smal arrows in the folder icons (085, 088, 149 and 163). than the arrows of the icon 085. "013, 014, 044, 054, 060, 070, 097, 106, 107, 108, 109, 122, 124, 125, 126, 127, 128, 129, 132, 153, 312"
These icons shows only the "internal ID" of the icon. This is a great icon pack. I found a problem, though: The link overlay (the little arrow in the left bottom corner) hides the original icon. Are you planing on doing a drivelib? Great set. In my eyes this a candidate for a new Icon set for TC 9.0! Just wanted to say: very nice! Fixed colors and arrows. Thanks for advice. I'm working on app icons for bars and file type icons for associations. @efesreal, I've fixed the icon libary "wcmicons.dll". All icons show the correct number now. I've used internal command name as icon number. Why do you need correct icon number? Because it is standard! Windows use a numeration in the shell32.dll library and Total Commander in the wcmicons.dll library. And also all program files (exe). could you improve the system file icons. That ! in read looks ugly. Like in hiberfil.sys etc. 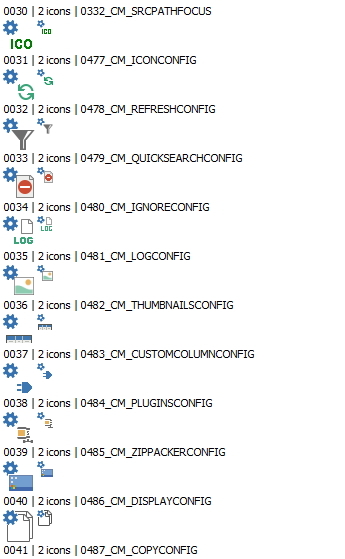 tosbsas wrote: could you improve the system file icons. That ! in read looks ugly. Like in hiberfil.sys etc.